Isn’t that wonderful? I’ll never be able to do anything similar, but I sure appreciate it a lot. I have to confess that an elfish warrior is my favourite RPG character. Not very original, I know, but I’m stable in my preferences. Never had such a great miniature though! It means I will also need to accelerate my other, even newer plan, a plan to get rid of some of the books. I’ll be honest – there were times when I was ready to take just about everything, as long as it had two covers and some pages in-between. I’ve also kept (almost) every book I’ve read, even when I hadn’t liked and was sure I’ll never re-read nor recommend it to anybody. Then there are school reference books, now obsolete in both content and form. I’m keeping a few favourites, the rest have to go. 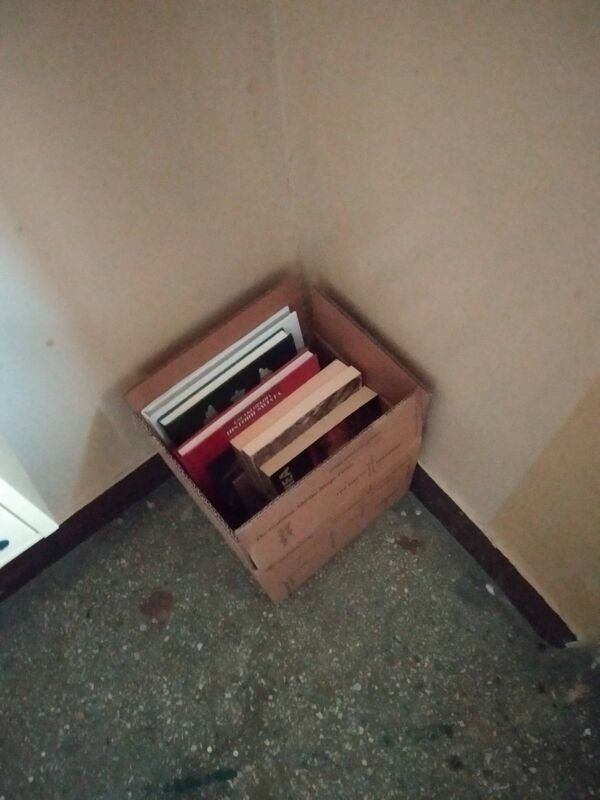 Also – some duplicates, I really don’t need two editions of Sun Tzu 😉 And some II World War books of close-to-zero value, presenting outdated, politically motivated views on some very narrow topics. It’s been almost a week and only about a third of the have been taken so far. Several books that had potential I’ve saved for later, when I have time to put them on Allegro (Polish equivalent of eBay), but there are not many – I’m keeping the good books for myself. To put things in perspective – during the last few months I’ve discarded about 120 volumes, less than 5% of my library, and I kept buying new ones. But the exponential growth of my library was unsustainable. There are whole categories I’ve decimated, like communist propaganda (never a believer, but they are interesting, in a way), self-published IIWW memoirs, textbooks. A few examples of each – kept, the rest – gone. Most of the adventure books I’ve loved in my pre-fantasy era will probably go to my cellar. Karol May and suchlike. Dang, that elf is cool! I’ve always been a fan of paladins or straight up knights (I know you’re totally surprised at that!). Do you cosplay? Or is that going one step too far? Well now you can kickass in the miniature department! A good purge once a while can be very satisfying mentally. Part of the appeal of having a collection is curating. 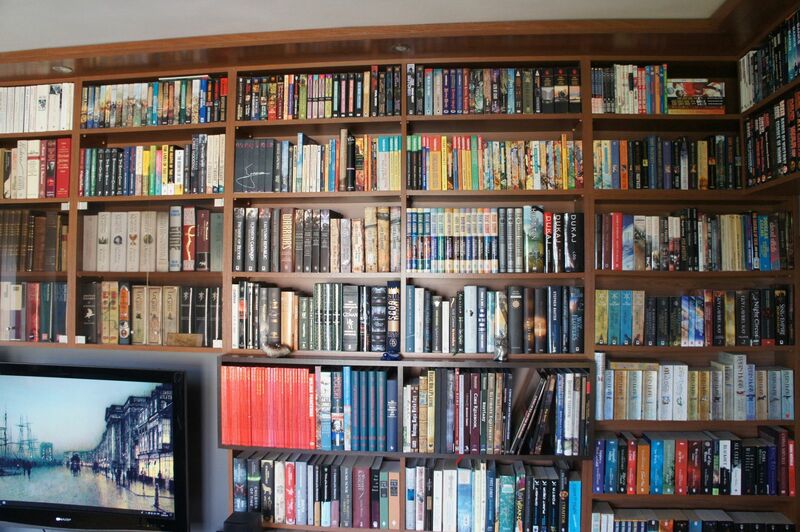 Your living room library is absolutely BEAUTIFUL! I know the feeling of purging – I gave away about six or seven books over the past weekend and it was a weird feeling. I do mini purges each year, so that I can fit more books I like into my shelves. I’m in the middle of a big move though, and I actually had to do a real purge… so many books I had to give away, but it was quite empowering when I was deciding which books to keep and which to let go of. Mini purges I’m learning to enjoy, big ones…can’t even imagine, and hope never to go through. Still, what’s not to like about that warm cocoon-like embrace of a shelf-lined room? 🙂 Very impressive! Also love your collection! And man… I dread the day I’ll have to purge my own collection… Yikes! And it was hand-painted by a friend 🙂 a pearl in my small collection. I love that living room! And that mini! I am the Dungeon Master for my Dungeons and Dragon campaign, so am getting to paint a few cool minis. Love seeing things like that. Yea, we play 5th Edition D&D. I’m an author (and really good at voices) so the whole storytelling thing is easy as a DM. I’m hoping to get back into playing warhammer in the future. It is, based on the Savage Worlds, and looks really nice. We created our characters, tested the rules, but haven’t yet a regular game. Warhammer is really popular in Poland, partially because it was the first system to be translated and readily available in mid-90ties, when the whole thing started here. D&D was a bit late. Let me know how the game goes when you get to play it. Really interested to hear how it plays. Belated happy birthday – and what a great present! Makes me want to get out my half-painted (not very well) Dark Elves army again. Not played D&D properly for a long long time, Call of Cthulhu sounds fun though. I’m just not patient with long games, always preferred the books. Impressive unhaul / purge. Even though it was probably hard to say goodbye to long-term occupiers of the epic library lounge you have. But that means more room for new books! Call is very good, but difficult for a Game Master, more than typical fantasy. That was long ago, but now I play a lot of Eldritch Horror, nice boardgame with definitely Lovecraftian feel, although quite long a complicated. One of the few Warhammer armies that Games Workshop do where there’s a balance of genders – plus great looking & pretty messed up society. And I’m absolutely in love with your library-living-room – I’d kill for that much book space.